The Duke of Wittaker has been living a lie... He's been spying on the dissolute, discontented noblemen of the ton, pretending to share their views. Now he's ready to step out of the shadows and start living a real life...but when the prime minister of England is assassinated, he's asked to go back to being the rake-hell duke everyone believes he still is to find out more. Miss Phoebe Hillier has been living a lie, too... All her life she's played by society's rules, hiding her fierce intelligence and love of life behind a docile and decorous mask. All it's gotten her is jilted by her betrothed, a man she thought a fool, though a harmless one. But when she discovers her former fiancé was involved in the plot against the prime minister, and that he's been murdered, she realizes he wasn't so harmless after all. And now the killers have set their sights on her... The only man who can help her is the Duke of Wittaker--a man she knows she shouldn't trust. And she soon realizes he's hiding behind a mask as careful as her own. As the clock ticks down to the assassin's trial, the pair scramble to uncover the real conspiracy behind the prime minister's death. And as the pressure and the danger mounts, Phoebe and Wittaker shed their disguises, layer by layer, to discover something more precious than either imagined-something that could last forever. Unless the conspirators desperate to hide their tracks get to them first. 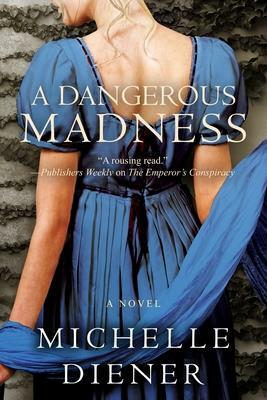 A Dangerous Madness is connected to The Emperor's Conspiracy and Banquet of Lies, although like those two novels, it stands alone.